88% of 2009–2013 graduates who applied to graduate programs in biochemistry, molecular biology or another science were accepted. Understanding what living things are made of and how they function is part of fulfilling God’s command to take care of the earth. At BJU you’ll take an in-depth look at living things on both the cellular and the molecular levels, so you’ll be equipped for a career in biomedical research, molecular biology, medicinal chemistry, pharmaceuticals, genetics, cancer research or one of many other options. Additionally, you’ll learn how to think like a scientist by working through significant problems. You’ll discover that thinking biblically about your field contributes both to your understanding and to your success in the vocation you choose. 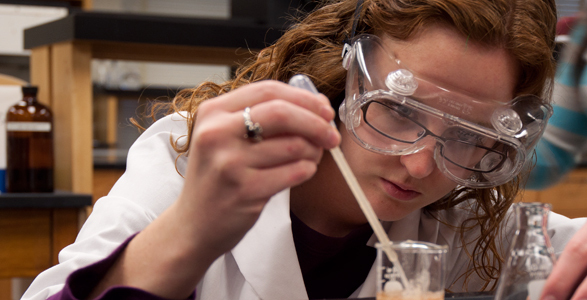 BJU’s biochemistry and molecular biology program gives you a solid groundwork in biology before tackling the chemistry of living things, including proteins, nucleic acids, electron transport and cellular regulatory systems. The program is highly interdisciplinary, so you’ll build a foundation in core subjects, such as mathematics and physics. Additionally, each week you’ll put into practice what you’re learning in the lab. During your time in the lab, you’ll learn how to work well with your peers, and you’ll become adept in lab procedures and in using standard lab equipment. Your lab work will culminate in a research project during your senior year. In this project, you’ll use what you’ve learned to formulate an original research proposal and then implement it. Throughout your courses you’ll also learn about the evolutionary framework of science so that you can understand how evolutionists think, and more importantly, how a biblical worldview gives more reasonable explanations of science than what an evolutionary worldview has to offer. The BJU Core will further prepare you to excel in what God has for your future, both in your career and in your personal life. You’ll improve your skills in communication, organization and critical thinking through subjects such as English, history and science. Through the BJU Core you’ll learn more about the world around you so you’ll be able, like Jesus was in His time on the earth, to make biblical truths understandable to people from a wide variety of backgrounds. And you’ll learn how your work ethic itself can be a witness—a reflection of God and His glory. 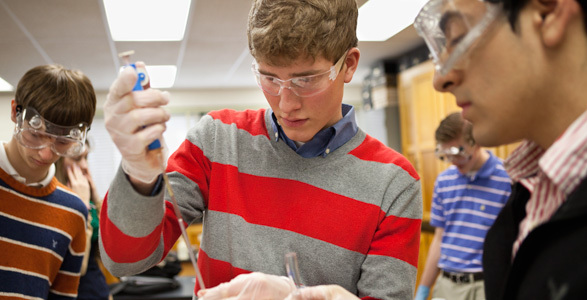 Biochemistry and molecular biology is a highly specialized program with all your electives being part of the BJU Core. If you would like to take additional electives, you can explore taking classes over the summer through BJUOnline or increasing your class load during the semester. Bob Jones University provided me with a solid foundation for succeeding in the field of secular academia. My chemistry professors taught me to be diligent in studying to achieve a deeper understanding of chemistry. With their help and guidance, I was able to get accepted into graduate school at the University at Buffalo, which led to my appointment as a chemistry teaching assistant. The biblical emphasis helped reinforce my convictions so I can represent my Savior with my life decisions. I continue to praise the Lord in how He has worked in my life in giving me success in my current work situation. I have been promoted in my teaching assignments and have even been appointed as a teaching assistant for a higher-level chemistry course. I pray that Bob Jones University is able to continue to help their students understand to focus on Christ first and then He will lead them and bless them as they strive to serve Him in whatever field He has placed them. We equip our students in the biochemistry and molecular biology program for further studies in graduate programs and entry-level positions in biotechnology, pharmaceuticals, forensics, medical research or related industries. BJU offers students a variety of ways to network with employers and organizations. A multitude of job opportunities are posted each year on CareerCentral, our online placement service. In addition, over 60 businesses and 150 Christian schools/mission boards/Christian organizations come on campus to recruit students through on-campus interviews and job/ministry fairs. The Career Services office also helps students by holding seminars on resume preparation and interview techniques. NMR spectrometry is one of the most important methods of analysis used to determine molecular structure. Gas chromatography is used to analyze mixtures of organic compounds; the mass spectrometer is a sensitive and selective detector that considerably enhances the utility of the GC. IR spectrometry enables the chemist to identify key functional groups on molecules as well as to examine their vibrational fingerprints. This instrument is used to analyze metals in samples that have been introduced into a stable, geometrically controlled flame. Liquid chromatography is one of the most important standard methods of analysis used in laboratories in a wide range of commercial and research contexts. This instrument is equipped with a variable-wavelength UV (ultraviolet) detector that enables the detection of a wide range of substances. This electroanalytical instrument is used to study oxidation-reduction processes with experimental techniques known as cyclic voltammetry, chronoamperometry and chronovoltammetry. You also have the option of joining the American Chemical Society and attending meetings of the Western Carolinas section. You can also apply for one of a limited number of summer positions available in the BJU Research Immersion for Undergraduates program or in BJU’s cancer research lab. All biology and chemistry faculty have earned PhDs from research institutions in subject areas that include microbiology, analytical chemistry, plant physiology, biological sciences, pharmaceutical sciences, analytical chemistry, entomology and agrobiology, and agrochemistry. Several have more than 30 years of teaching experience, and all have published articles in peer-reviewed research journals. Almost all have participated in multiple summers of the BJU Summer Institute in Teaching Science. Since joining the faculty at BJU some have participated in summer research and done consulting for commercial companies, other universities, or the U.S. military. Critically analyze scientific data and ideas. Account for the chemical and physical properties of proteins, nucleic acids, and other molecules in terms of chemical concepts and principles. Employ the scientific method in designing experiments in the laboratory to answer scientific questions. Execute standard biochemical laboratory techniques. Compose reports that communicate conclusions drawn from the analysis of biochemical data.